Wizard for hire Harry Dresden gets mixed-up with the dead in this “haunting, fantastical novel”(Publsihers Weekly) in the #1 NewYork Times bestselling series. Harry Dresden’s faced some pretty terrifying foes during his career. Giant scorpions. Oversexed vampires. Psychotic werewolves. It comes with the territory, when you’re the only professional wizard in the Chicago area phone book. 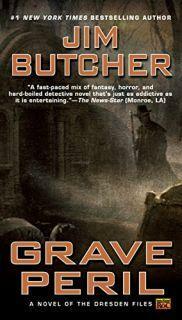 Grave Peril is the third book in the excellent The Dresden Files series by Jim Butcher. In this third book Chicago wizard Harry Dresden and his friends face off against ghosts and vampires. The suspense and action are a constant of the series and Harry continues to balance on the edge while taking risks that would kill or damn any mere mortal. But Harry is special, not only is he a very powerful wizard but he is extremely stubborn and never gives up regardless of the odds, the risk to his friends and loved ones, or his own pain. His willpower and desire to do what he sees as right regardless of the risk is what makes this series so enjoyable. Some of the best moments in this book are between Harry and his girlfriend. He is a very emotionally reserved man (most of us are) yet he admits his love for his girlfriend and very much wants her to avoid attending a very dangerous vampire ball. Of course she doesn't listen and goes anyway and Harry must protect her in a house full of vampires that want nothing more than to kill them both. I give this book four stars out of five because Harry is a great character and his relationships with his friends and enemies are always enjoyable to read. The vampire scene was excellent yet some parts of the book were not as memorable. The series should continue to get more interesting based on where this book ended and I look forward to reading more of it.